Identity theft and identity fraud are terms used to refer to all types of crimes in which someone wrongfully obtains and uses another person's personal data in some way that involves fraud or deception, typically for economic gain. Identity theft is a scourge that unfortunately will only get worse for a decade or longer. Much has been said and a tremendous amount of misinformation has been published regarding the problem and its solutions. Yet, unfortunately, those who are in the best position to fix the problem—including government agencies, industry, and even the public—can't agree on how to fix it. It is important to dissect and disseminate each form in order to understand its nature, the reason why it prospers, and its impacts on victims. Not all result in immediate financial loss to the victim; over time, however, and depending on the nature of the identity thieves’ actions, the victim often ends up paying in some way. In this article, we discuss the top 3.
Business or commercial identity theft entails using a business' name to obtain credit or even billing a business' clients for products and services. Often, but not always, a Social Security number (SSN) of a company officer is required to commit business identity theft. Federal ID or Employee Identification Numbers are readily available in public records, dumpsters, or internally, thus facilitating this crime. Perpetrators who commit business identity theft are often insiders or current or ex-employees with direct access to operational documentation who pad the books in favor of their scheming. Victims of business identity theft often do not find out until losses build significantly or someone internally sees discrepancies on the books. Businesses lose vast amounts of money because of the hidden nature of the transactions. Business identity theft can go on for years undetected. Financial identity theft in the form of new account fraud generally means using another's personal identifying information to obtain products and services using that person’s good credit standing. Numerous forms of financial identity theft can occur. The opening of new utility, new cell phone, or new credit card accounts is the most prevalent form of new account fraud. Because the thief is likely to use a different mailing address, the victim never sees the bill for the new account. When this type of fraud involves a credit card, once the new plastic is issued, the criminal turns it into cash very quickly. 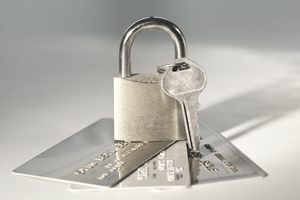 What is often, but not always, required for most lines of credit and to commit new account fraud is the victim's SSN, which has become the key to the kingdom. Once in the wrong hands, the SSN can have devastating effects. Victims of new account fraud usually learn that they are victims when they receive calls or letters from bill collectors, who will eventually find the rightful SSN holder. Victims may also be denied credit as a result of applying for loans. Financial identity theft in the form of account takeover fraud generally means using another person's account information (for example, a credit card number) to obtain products and services using that person’s existing accounts. It can also mean extracting funds from a person's bank account. Account numbers are often found in the trash, hacked online, stolen out of the mail, or lifted from wallets or purses. Once the thieves obtain this data, they may use the information right at a point of sale or access individual accounts online, over the phone, or through the postal service. Social engineering of the entity processing the data is almost always required at some level: Lying to turn the data into cash, the criminal poses as the victim. Victims are often the first to detect account takeover when they discover charges on monthly statements they did not authorize or funds depleted from existing accounts. Sometimes the victim will find out their bank account was compromised as a result of numerous charges from bounced checks.